TCL today announced the KEY2, a second-generation BlackBerry phone that combines a large screen, full QWERTY keyboard, and hardened Android software in an aluminum body. The company made a number of changes to the chassis in order to resolve consumer pain points. It has a sleek metal body that has fewer sharp edges. TCL reworked the soft touch rear panel and gave it a new diamond pattern. The KEY2 carries over the 4.5-inch full HD screen of the original with 2.5D curved Gorilla Glass. TCL reduced the forehead and chin in order to accommodate a taller keyboard, which has been completely redesigned. The physical keyboard supports trackpad functionality and includes a new fingerprint reader in the space bar. The KEY2 introduces what TCL calls the Speed Key, which is a universal shortcut key that is user programmable. Internal specs include a Snapdragon 660 processor with 6 GB of RAM, 64 GB or 128 GB of storage, and space for a microSD card up to 1 TB. The battery measures 3,500mAh and TCL claims it delivers two days of use. The battery charges rapidly thanks to support for Quick Charge 3.0. The rear includes two 12-megapixel cameras. The main lens has a 79.3-degree field of view and aperture of f/1.8, while the second has a 50-degree field of view and an aperture of f/2.6. The second sensor is meant to help with depth information for portrait-style shots. Other camera features include PDAF, 4K video capture, and two-tone LED flash. The front camera boasts an 8-megapixel sensor with an display-based selfie flash and full HD video capture. The phone runs Android 8.1 with BlackBerry Hub+ and the company's DTEK security software. The KEY2 will be sold in several variants around the world. TCL says one version will work well in the U.S., including on the networks operated by AT&T, Sprint, T-Mobile, and Verizon Wireless. The BlackBerry KEY2 costs $649 and goes on sale globally this month. The BlackBerry KEY2 takes the basic design of last year's phone and makes improvements all around. The phone has a decent-sized screen, physical QWERTY keyboard, and metal chassis. It's true there is no CDMA, but it does have band 13 and Verizon doesn't require CDMA anymore. So it's only a problem if you wanted to use it with Sprint. The best phone announced this year! 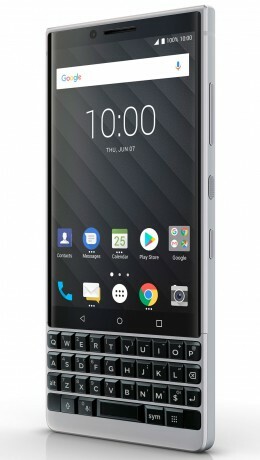 My wife LOVES her KeyONE, and will certainly be upgrading to this once it comes out. I'm glad they retained the size and headphone port. Maybe now they'll have 8.1 ready for the KeyONE since the Key2 is shipping with it.